Naval warfare is perhaps one of humanity’s oldest forms of international war and for many decades battleships were the greatest naval weapons. The modern armored ship traces its history to ironclad ships from the 19th century. Battleships reached their peak during World War II and eventually gave way to the modern aircraft carriers and amphibious warships. This list contains the largest battleships from World War II, which were the largest ever built in history, as well as the current largest modern amphibious warship. The FS Richelieu and FS Jean Bart were the last two French battleships. Both battleships were the largest ships ever built by the French. Two other ships were actually planned for the Richelieu Class, the Clemenceau, which was never completed, and the Gascogne, which was never laid out. The Richelieu Class battleships were 813 feet 2 inches (247.85 meters) in length and had a displacement of 48,180 long tons (48,950 tons). 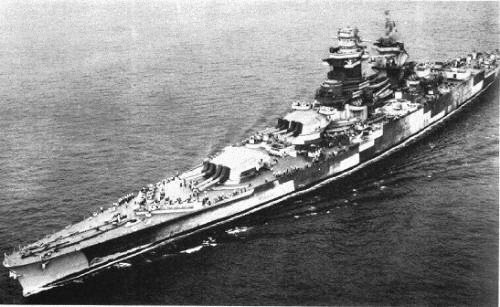 The French built the Richelieu Class battleships to counter the Italian Navy under the leadership of dictator Benito Mussolini. 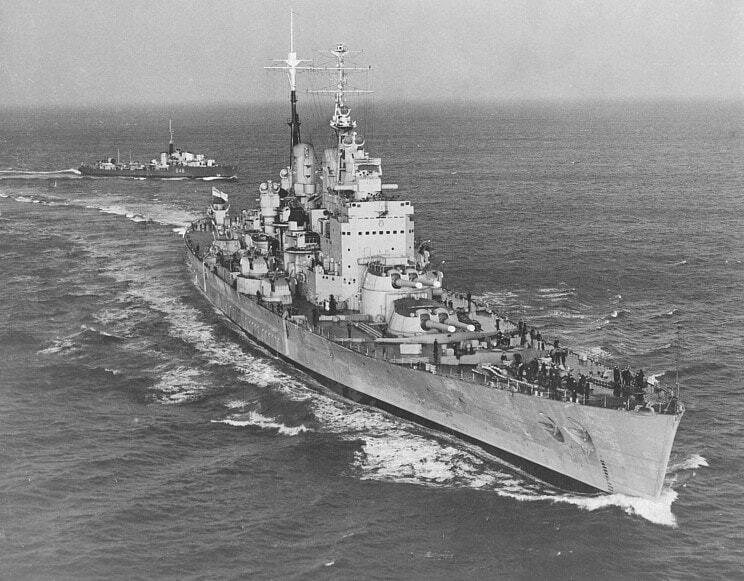 Both the FMS Richelieu and FMS Jean Bart survived World War II and were decommissioned in the 1960s. The FMS Richelieu was under control of both the Allied and Axis powers during World War II, but surprisingly never managed to sink an enemy ship. The HMS Vanguard was the last battleship built by the British Royal Navy. Although the HMS Vanguard was built for World War II, construction started too late into the war. After the War ended in 1945, the British Royal Navy decided to finish the battleship in case the war against the Japanese Empire dragged on. Although the HMS Vanguard wasn’t used during World War II, the battleship was outfitted with the most anti-aircraft guns of any ship in the Royal Navy. Despite such heavy armament, the HMS Vanguard never fired any of its guns. The HMS Vanguard was used to carry out a few NATO duties during the Cold War before it was decommissioned. Since the HMS Vanguard was never used for war, it became a royal yacht in 1947 and carried the Royal Family of King George VI to South Africa. The KMS Bismarck and the KMS Tripitz, which were the only two ships in the Bismarck Class, were the two largest battleships that Nazi Germany had during World War II. Both ships were about 823 feet 6 inches (251 meters) in length and had a displacement of over 49,500 long tons (50,300 tons). 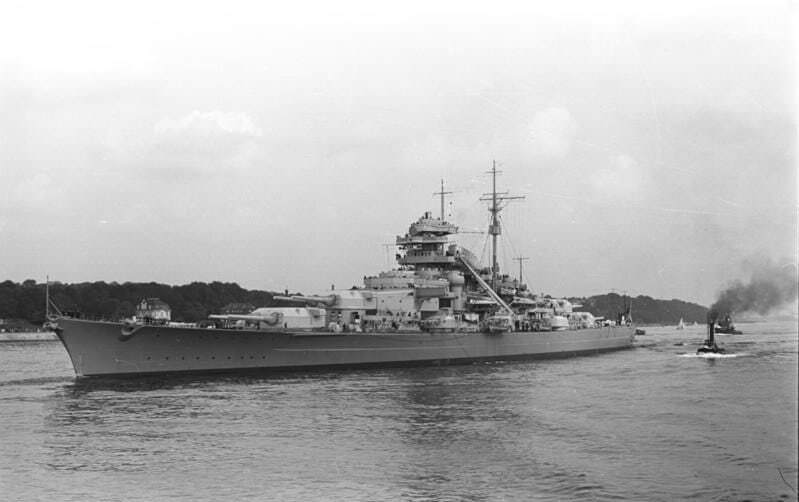 The KMS Bismarck is the more famous of the two Bismarck Class ships and was known for its power. Reportedly, the KMS Bismarck single-handedly deterred much of the British Royal Navy, which dedicated numerous ships and resources to hunting down Hitler’s flagship. The KMS Bismarck finally went down in 1941. The key to the KMS Bismarck’s survival was its armor. About half of the KMS Bismarck’s weight was made up of the armor that protected the ship’s vital areas. The Admiral Ushakov, previously known as the Kirov, was the flagship battlecruiser in the Russian Navy’s Kirov Class of ships. The Kirov Class were the largest warships built by the Russian Navy. The Admiral Ushakov was a nuclear powered battlecruiser that was 827 feet (252 meters) and could essentially travel endlessly with its nuclear power. 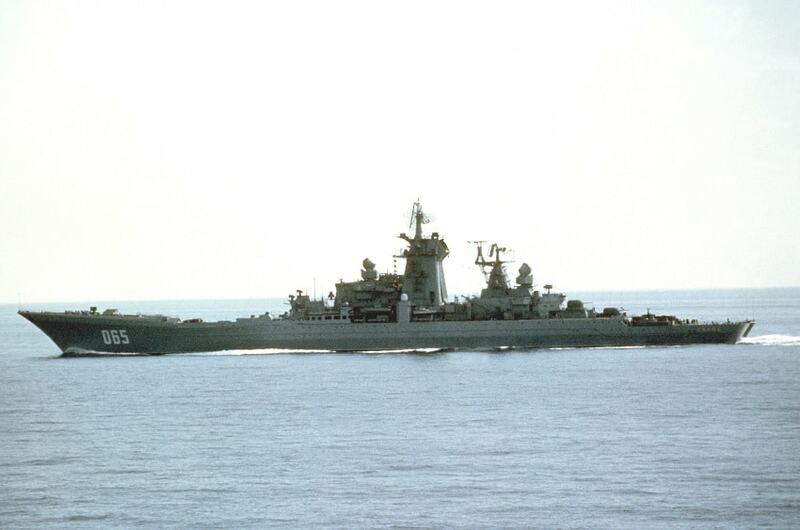 The Admiral Ushakov is currently decommissioned after plans to modernize the battlecruiser were scrapped. The Kirov Class battlecruisers were active during the Cold War, which forced the United States to reinstate its Iowa Class battleships, which were from World War II. Despite the Admiral Ushakov’s history as of 2018, the ship is laid-up and there are plans to turn it into scrap. The USS America is not a battleship in the strictest sense, but it is the United State’s largest modern amphibious assault ship/helicopter carrier. The USS America is the first of a total of four ships planned for the America Class. This modern warship was launched on June 4, 2012 and officially commissioned in 2014. 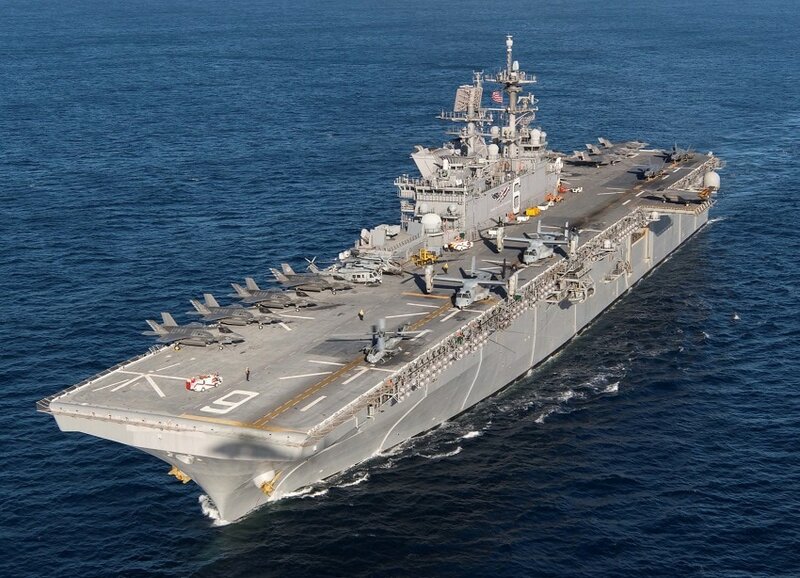 The USS America is 844 feet (257 meters) long and has a displacement of about 44,971 long tons (45,693 tons). The ship has a crew of about 1,060 and can hold up to 1,690 crew members if necessary. Currently, the USS America is based out of San Diego, California. The USS America is armed with two Rolling Airframe Missile Systems; two Evolved Sea Sparrow surface-to-air missile systems; and seven .50 caliber heavy machine guns. The HMS Hood was the largest battleship ever built by the British Royal Navy. Construction of the HMS Hood began in 1916 during the midst of World War I. The HMS Hood was launched two years later and was officially commissioned by the Royal Navy in 1920. 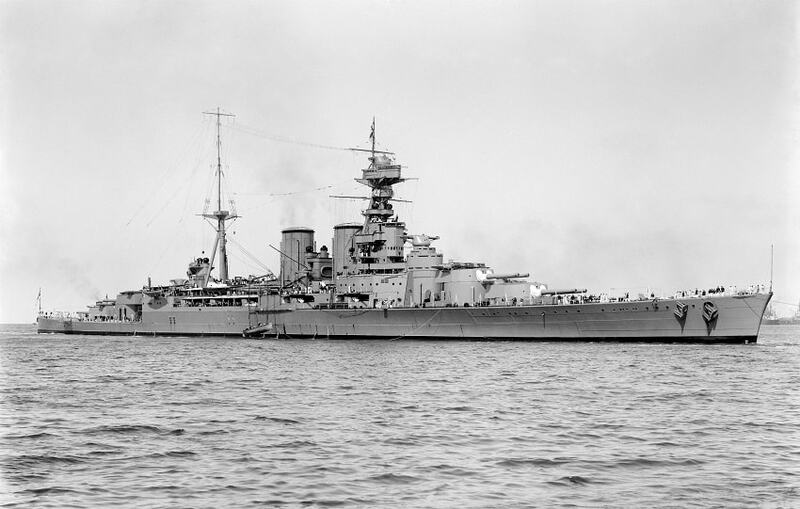 In the years prior to World War II, the HMS Hood traveled around the world and the battleship was forced back into action when World War II started without the planned upgrades the ship was supposed to receive. Due to this, the HMS Hood was ill-equipped to deal with the newer weaponry and the ship was sunk by the the Bismarck, a German battleship. It only took about three minutes for the HMS Hood to sink and only three of the ship’s 1,418-man crew were rescued. The Imperial Japanese Navy’s two Yamato Class battleships are largely considered the most powerful battleships ever built by any country. The IJN Yamato was the lead ship in the class, while the IJN Musashi was the second ship in the class. Both ships were massive and had a displacement of 72,000 long tons (73,000 tons) and were nearly 863 feet (263 meters) long. 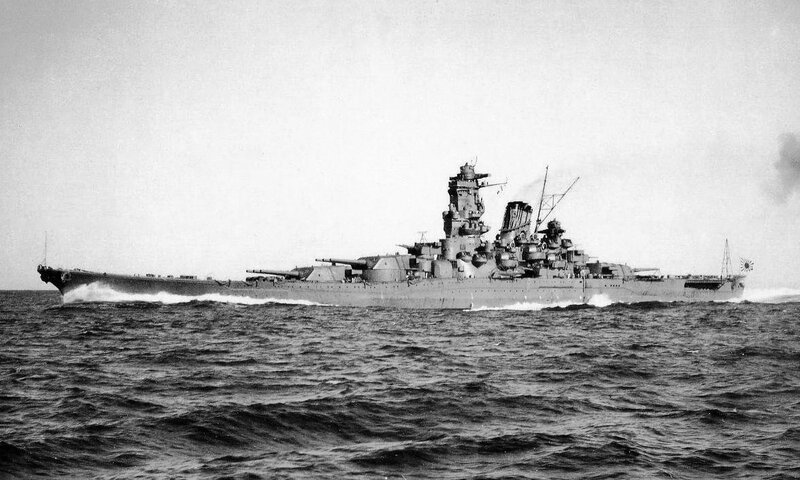 Despite their formidable power, both of the Yamato Class battleships were sunk during World War II. Both Yamato Class battleships were the most heavily armed battleships that ever existed and the main guns were 18.1 inches, the largest caliber types ever used. In 2015, the IJN Musashi was finally discovered by Paul Allen, the co-founder of Microsoft, after shipwreck hunters tried to locate the ship for the past 70 years. The Iowa Class battleships were the last true battleships built by the United States and were the largest battleships ever built in terms of length. The battleships were all about 887 feet 3 inches (270.43 meters) in length and had a displacement of 57,540 long tons (58,460 tons). 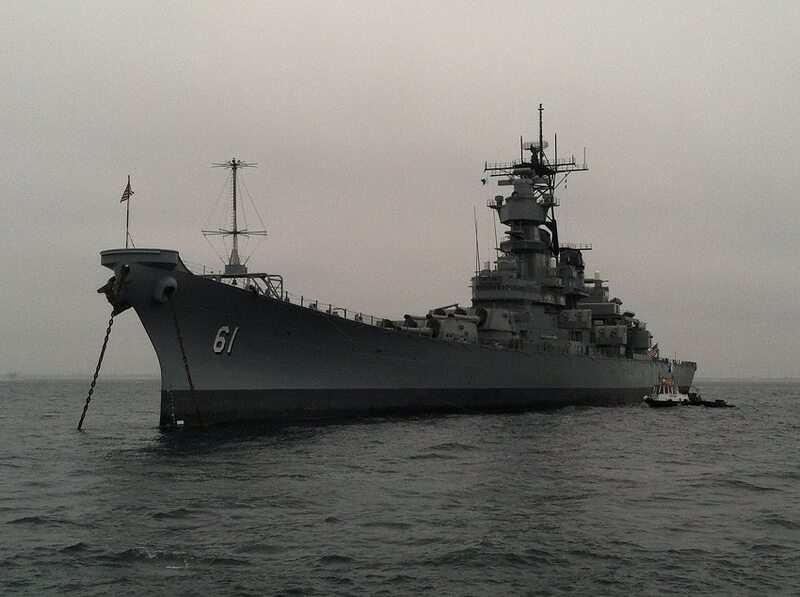 There was a total of four Iowa Class battleships and the lead ship was the class’ namesake, the USS Iowa (BB-61). The Iowa Class battleships were built for World War II and were in use until the 1990s. All four of the Iowa Class battleships were decommissioned and are preserved in various maritime museums in the United States. The Iowa Class battleships are the only complete class of warships that have been preserved for public display.